Integrity and professionalism – it is important to always be honest (even if the truth hurts) to build strong trust and eventual long-lasting relationships. Education and excellence – client interactions are designed to improve performance through sharing knowledge and industry best practices. Win-win relationships – the one and only purpose of each consultation is to help the client succeed. Friendly approach – just because we spend more time working than we have free to dedicate to our personal lives, that doesn’t mean we can’t have fun doing it. Community involvement – assisting local charities by lending a helping hand is an integral part of what the business stands for. Your firm should have core values to serve as the foundation for how your business is conducted. (That is why they are also known as founding principles). Not only are core values the backbone to your organization, but they support your business mission, while also differentiating your business from the competition. 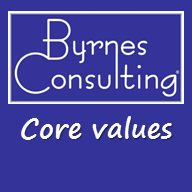 Work with Byrnes Consulting to define or refine your organization’s core values.